RKV IT Solutions has an extensive in-house graphic design team. With their exceptional skills and talent, RKV IT Solutions can take an idea or concept and turn it into a powerful and effective piece of visual communication. 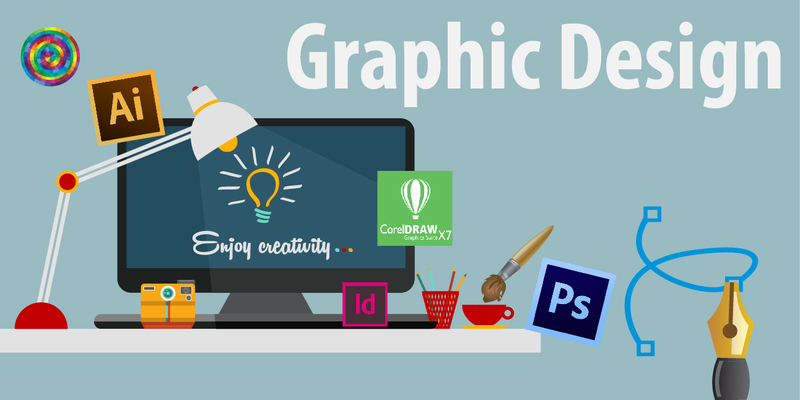 Our talented graphic designers in Patna can also act as a back-end partner for clients with resource and time restrictions. Advertising agencies and large marketing departments the world over use our graphic design team for design adaptations, new creatives, extending master concepts into different extensions, and for bulk layout operations - all at a fraction of the cost of local market rates. Establishing your corporate identity is vital to effective marketing and creating a strong company logo is an essential step in identifying and differentiating your company from its competitors! When it comes to Branding, Logo Design & Identity Design, RKV IT Solutions is an established name in Patna. We have been into logo design & branding business for the past 5 years and have designed logos & business stationery for many clients. RKV IT Solutions Pvt. Ltd. is the best logo designing company in Patna. "A logo identifies your business & speaks volumes about your business! Your logo is your company's trademark and the foundation of all your advertising campaigns. So a good logo should be easily remembered and should stand out to clearly state what your business represents." We understand the importance of above-stated facts very well & have the required creativity and skills to bring our logo design projects to life. At RKV IT Solutions, each logo is "Custom Designed" giving reality to client's vision. We have a logo design process that is simple, yet extremely efficient & our logo designers are skilled enough to extract the essence of your business and portray it into a powerful & attention catching logo. Contact us and let discuss how we can ensure that your company logo makes the "Right First Impact" on your prospects. A good quality banner has the ability to grab viewer's attention, and present your message clearly to your audience. Be it for your business website or an outdoor event, banners act as ideal promotional tools, to convince customers. At RKV IT Solutions, every aspect of the banner - from effective, catchy words, to the inclusion of positive color combinations, is meticulously conceptualized by our banner design professionals. This ensures that the banner design meets your requirements, as well as our stringent quality standards. Have you a new offer or product to launch and create an audience? Web Banner Designs can prove to be a simple yet a powerful marketing tool to put forth your message across the globe. RKV IT Solutions, as Web Banner Design Company in Patna, specializes in providing professional banner designs for engaging traffic and leveraging sales. It should have an attractive headline. It should have compelling content on it. It should have a unique offer with it. There has to be a call to action button which attracts the eye. Be it a static banner design or a flash banner design, our graphic designers would take care of all your needs. We at RKV IT Solutions offer innovative brochure design services. We are a brochure design company in Patna that can provide you with a full range of creative design services that include brochures or flyers for marketing, sales, training, etc. Unlike most of the companies, we don't start our project from the keyboard. Designing brochures for companies without knowing about them or their target audience would hamper marketing success. In order to portray a company on paper, we ought to know the company first. As a Brochure Design Company in Patna, we design beautiful brochure designs with a clean and engaging presentation of both text and images speaking for the company. We are here to help you in having best graphic designs. Feel free to contact us at info@rkvitsolutions.com with any questions or queries regarding graphic designs and we will respond immediately to your inquiry. Designed by: RKV IT Solutions Pvt. Ltd.